The Bill and Melinda Gates Foundation has just celebrated the tenth anniversary of its Grand Challenges in Global Health Programme. One of the original projects that holds great promise of success is Scott O’Neill’s plan to combat the spread of dengue fever. His objective is to introduce bacteria that can inhibit the development of the dengue virus into populations of mosquitoes that spread dengue from person to person. This bacterium is Wolbachia. The question now being asked is could this strategy also be used to control the spread of malaria? 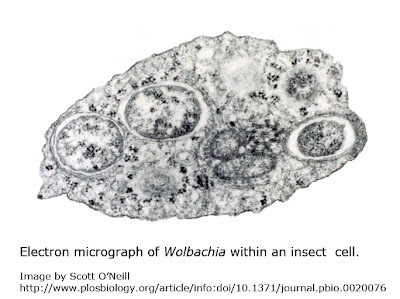 Wolbachia is a genus of intracellular bacteria that infect many arthropods (particularly insects), as well as some round worms. Infected females can pass the bacteria on to their offspring in their eggs, and thus the maternally inherited endosymbiont infects the next generation. Wolbachia can spread very rapidly through a population by changing the reproductive potential of its host, giving infected individuals a reproductive advantage. One method that causes this is known as cytoplasmic incompatibility. Here, uninfected females that mate with Wolbachia-infected males produce no progeny, whereas there is no reduction in the number of offspring infected females produce, no matter whether they mate with infected or uninfected males. Infected females thus have a strong selective advantage. Cytoplasmic incompatibility Unidirectional CI: Mating of infected males and uninfected females results in CI. All other crosses are compatible. In Drosophila, Wolbachia pipiens was known to reduce the lifespan of the insect and to up-regulate many immune genes. These properties would be highly beneficial if they could be used in strategies to control the many diseases transmitted by mosquitoes; mounting an immune response against parasites as they develop in the vector. However, with a few exceptions, Wolbachia do not naturally infect anopheline mosquitoes that transmit malaria, nor do they infect Aedes aegypti, the vector of arboviruses that causes diseases such as dengue, yellow fever and West Nile disease, as well as round worms that cause filariasis. Initially research was focussed upon getting the bacteria to infect Ae. aegypti. A strain of Wolbachia pipiens, called wMelPop, was stably transfected into this mosquito. It halved the vector’s life-span, upregulated a number of immune genes and inhibited the development of filarial worms and an avian malaria parasite. The non-virulent Wolbachia strain, wMel, was found to be more successful in invading populations of Ae. aegypti than the life-shortening strain and, in contrast to wMelPop, had no deleterious effect upon fecundity and fertility. Both strains were found to block transmission of dengue serotype 2. Mosquitoes stably infected with the wMel strain were then introduced into two natural populations of Ae. aegypti near Cairns in north-eastern Australia by a team led by Scott O’Neil and, after two years, wMel have been shown to persist in these populations at high frequencies. Programmes to release wMel-infected mosquitoes in Brazil, Indonesia and Vietnam are now underway as part of dengue-control strategies. The exciting prospect of also using a Wolbachia-based strategy, to control malaria transmission by anopheline mosquitoes attracted the attention of vector biologists. However,the creation of stably transfected populations of these mosquitoes proved technically much more difficult than Ae. aegypti. As an initial step forward Steven Sinkis and colleagues reported the creation of somatic infections with the wMelPop strain that last the lifetime of the individual mosquito but are not passed on in the germline. Several immune genes were upregulated in these mosquitoes and, when they were challenged with Plasmodium berghei (a rodent malaria parasite) the number of parasites that developed was significantly reduced. When RNAi interference was used to knockdown TEP1, one of the upregulated immune genes, parasite numbers were restored to those in insects uninfected with Wolbachia. This suggested there may be some involvement of the immune system in suppression of parasite numbers. This looked promising, however work from Jason Rasgon’s lab found that a Wolbachia strain from Aedes albopictus, wAlbB, actually increase the number of P. berghei that developed on the midgut whereas a comparison of somatic infections of wMelPop and wAlbB strains showed both to significantly inhibit the development of the human malaria Plasmodium falciparum in An. gambiae. The study also showed wMelPop to be extremely virulent once mosquitoes were blood-fed. Attention thus switched to wAlbB. Clearly the effects of Wolbachia infection were not consistent against different species of Plasmodium and, in some combinations of Wolbachia / mosquito / Plasmodium, the mosquito becomes a better vector. Things moved forward last year when stable transfection of An. stephensi with the wAlbB strain of Wolbachia was reported. The bacteria were maternally transmitted with 100% efficiency and demonstrated a typical pattern of cytoplasmic incompatibility. wAlbB was able to spread in laboratory mosquito population and the bacteria conferred resistance to P. falciparum. Zhiyoug Xi and colleagues suggested a Wolbachia-based approach may, in the future, be integrated with other vector control strategies. However, the reported fitness costs associated with Wolbachia infection, particularly in An. stephensi, could be a serious obstacle. This summer an interesting discovery published by the Rasgon lab may have shed light on the difficulty of establishing Wolbachia infections in laboratory colonies of anopheline mosquitoes and the apparent lack of infection in most wild populations. Although An. gambiae suffered fitness costs associated with wAlbB infection, these costs were far more severe in An. stephensi. Mortality predominantly occurred following a blood meal when the natural microbiota increases substantially. When mosquitoes were treated with antibiotics, fitness costs were almost eliminated and Wolbachia was transmitted to the progeny of infected mosquitoes. High- throughput 16S sequencing led the researchers to identify Asaia, a species of bacteria that naturally infects the mosquito germ line and can be passed on to offspring, as being greatly reduced by the antibiotic treatment. When an antibiotic resistant strain of Asaia was introduced into the antibiotic-treated females the fitness costs of Wolbachia infection returned. As Asaia are found in some laboratory and field populations of mosquitoes these findings suggest they may be part of a natural barrier that would prevent the use of Wolbachia as a control strategy for malaria transmission. Amplification and sequencing of the 16S rRNA gene from samples of mosquitoes collected from mating swarms in three villages detected 12 infected individuals. Both males and females were infected and, although more infected An. coluzzii were found, the difference in prevalence between the two species was not significant. In addition, mosquito larvae collected from breeding sites in all three villages were infected with Wolbachia. To confirm that the bacteria were maternally transmitted to offspring, females containing eggs were collected from the same villages two seasons later and 21% of these were found to contain the Wolbachia 16S fragments. Offspring from all of the five females that laid eggs were positive for Wolbachia. Whole genome shotgun sequencing of two Wolbachia-positive samples revealed that the bacterium is a novel Wolbachia strain that the researchers named wAnga. It appears to be highly diverged from other insect Wolbachia strains and the team, led by Elena Lavashina and Flaminia Catteruccia, suggest that it may belong to an Anopheles-specific phylogenetic supergroup. It would be interesting to know whether Asaia bacteria were present in the microbiota of those Wolbachia-positive mosquitoes and, more importantly, to determine whether this new species of Wolbachia can inhibit the development of different species of human malarias in various anopheline vectors.